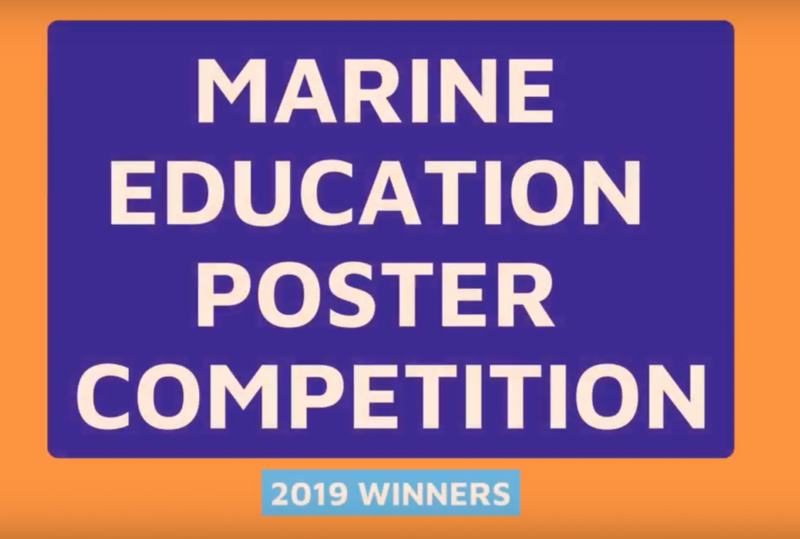 Click the image above to see a video of all of our Marine Education Poster Competition 2019 Winners! BLUE LAGOON ISLAND, BAHAMAS – Bahamian students reached for their coloured pencils and markers and showcased their creativity to demonstrate why everyone should stop ‘Trashing Our Treasure’ in the 19th Annual Marine Education Poster Competition hosted by Dolphin Encounters-Project B.E.A.C.H. on Blue Lagoon Island. A team of judges representing local environmental partners B.R.E.E.F. and The Bahamas National Trust had the daunting task of selecting winners from the 174 submissions. First, second and third place winners were chosen in each of four age-group categories and a first place prize was awarded in the Special Education category. Schools from around the country participated in the competition. In the Kindergarten through grade two category, the winners were: 1st place Kohen Stubbs, Xavier’s Lower School; 2nd place Brooke Stewart, Xavier’s Lower School; and 3rd place Taaja Curry, St Thomas Moore School. In the grades three through grade five category, the winners were: 1st place Logan Stubbs, Xavier’s Lower School; 2nd place Jacob Malone, Agape Christian School; and 3rd place Eugenie Vicart, Lyford Cay School. In the grades six through eight category, the winners were: 1st place Ciara Ferguson, Thelma Gibson Primary; 2nd place Julia Schreier, Lyford Cay School; and 3rd place Jessica Chiacchiari, Lyford Cay School. In the grades nine through grade 12 category the winners were: 1st place Danna Burreto, Tambearly School; 2nd place Danah Adderley, CC Sweeting Sr High School; and 3rd place David Ramtulla, Queen’s College. In the Special Education category, the winner for the second year in a row was Brandon Cox, Stapledon School. Attorney General Carl Bethel was on hand to present the awards and delivered a powerful message of encouragement to the students, parents and teachers at the ceremony. He used the message included on one of the winning posters to emphasize the need to take action. The teachers for each of the first place winners also received recognition and prizes. Shane Stewart of Xavier’s Lower School won for both the kindergarten thru grade two and grade three through grade five categories; Diane Telle, Thelma Gibson Primary won for the grade six through eight category; Mrs Deleveaux, Tambearly School won grade nine through 12 and Mrs Farquharson, Stapledon School won for the Special Education category. In addition to winning the teacher’s prize for two categories, his daughter won second place in the kindergarten through grade two category. Thelma Gibson Primary School art teacher Janice Rolle was excited to have the work of one of her students recognized. “You can use art in so many ways. It is a powerful way to express yourself and spread an important message – such as why we should take care of the environment,” she explained. Her colleague Diane Telle, a grade six classroom teacher at Thelma Gibson Primary was excited that the poster theme tied in perfectly with this year’s science and social studies curriculum which focuses on natural resources and the need to protect them for their future. “So this was their homework, but it was also an opportunity for them to enter the competition. And here we are with the first place winner,” she exclaimed. National Prizes for winning entries included passes to many of the exciting activities on Blue Lagoon Island, including Swim with the Dolphins, Sea Lion Encounter, Stingray Encounter, Beach Day, Segway Safari and even the Seaventure Summer Camp. This year, to recognize the importance teachers play in educating and encouraging students on these critical topics, Dolphin Encounters Project BEACH also awarded the teacher of each first place student a choice of four (4) Blue Lagoon Island Beach Day Passes or two (2) adult only VIP Beach Passes. Another exciting addition to the Marine Education Poster Contest this year is the chance to compete internationally for a trip to Cancun, Mexico. The original artwork of the qualifying finalists (ages 6-15) has been entered in the International Festival of the Oceans Drawing Contest hosted by Delphinus in Mexico. Winners of the international poster contest will win a free trip to Cancun. Tambearly School 11th grader Danna Morales said she was in shock to learn that her poster won the national high school category, but was proud to have an opportunity encourage others to protect the Bahamas’ most important natural resource. “The sea is very important to the Bahamas. It’s the most beautiful thing I’ve ever seen so it’s important to protect it. We have the power to do something and so we must,” she said.